Ontario’s Lake Country is your four season destination and summer is not short of any activities that visitors can enjoy, by themselves, with the family, with someone special. In Ontario’s Lake Country we are blessed to have so many activities offered in our area. With a variety of experiences such as paddling the waterways along the Orillia Cultural Route or enjoying a relaxing bicycle ride along the Millennium Trail through Orillia, Ontario’s Lake Country is your must-visit destination! Paddle & Pedal In Orillia! Orillia is a city rich in culture and history, a unique way to experience the city and really take in the beauty is by paddling the shoreline! Outfitters such as A Breath of Fresh Air and Kayak-Ity-Yak are set up along the waterfront in Orillia. 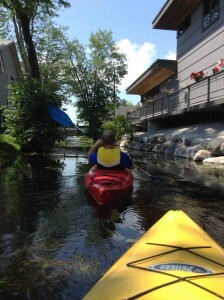 Our journey started in Couchiching Beach Park in Orillia with A Breath of Fresh Air where you can rent your kayak for as low as $9, If you are inexperienced in paddling the staff at A Breath of Fresh Air are very helpful and willing to help. Our route consisted of about 1 hour and took us through the Port of Orillia and along the shores of Cedar Island where at times it felt as if you are hours away from the bustle of the city. This paddle is easily done by any paddler of any level of experience! Make sure to get your guide on PaddleLakeCountry.com. Once we finished our paddle we continued through Couchiching Beach Park towards The Crank & Sprocket Bicycle Company. Along the way you will find French’s, a true hotspot during the summer months where you can find your refreshments. The Crank & Sprocket Bicycle Company offers a variety of services to the visitors in the Orillia area. The staff provided us with two bicycles to ride the Millennium Trail through Orillia. This route consists out of rail trail and is easily pedalled by any cyclist, the route is very secluded and is sheltered from traffic making it a relatively safe ride. We continued our route to The Leacock Museum Historic Site where you will be able to take in the beautiful architecture of the Leacock house, the scenic bay of Brewery Bay or have an ice-cream cone from the Leacock Café! 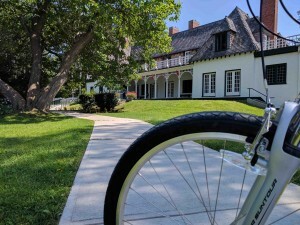 Experience Orillia differently by pedalling the Millennium Trail and paddling the Orillia Cultural Route an experience that should be on your summer bucket list!